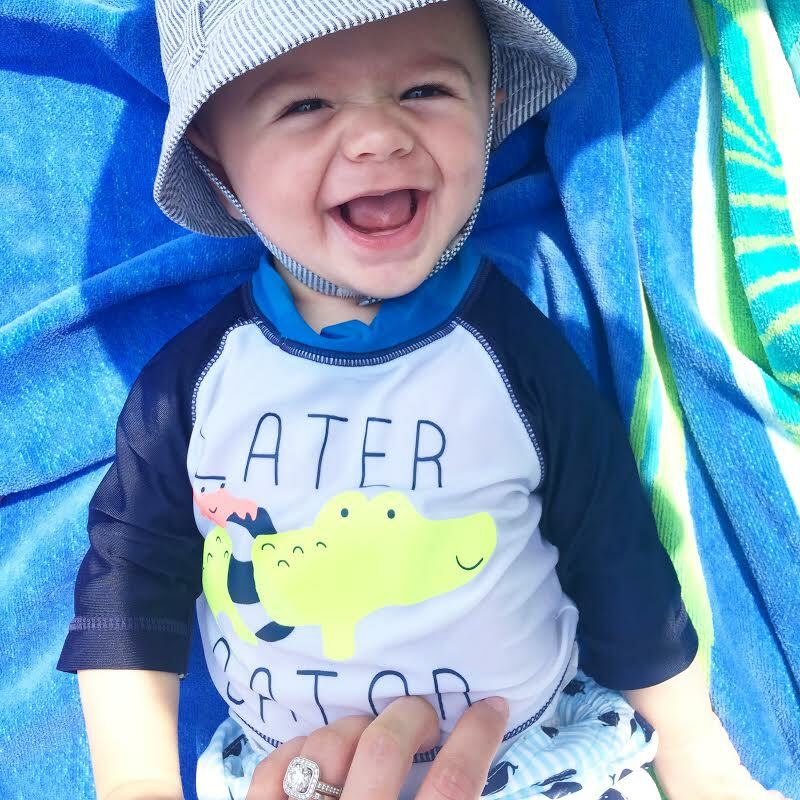 There's a new water baby in town and his name is Camden. 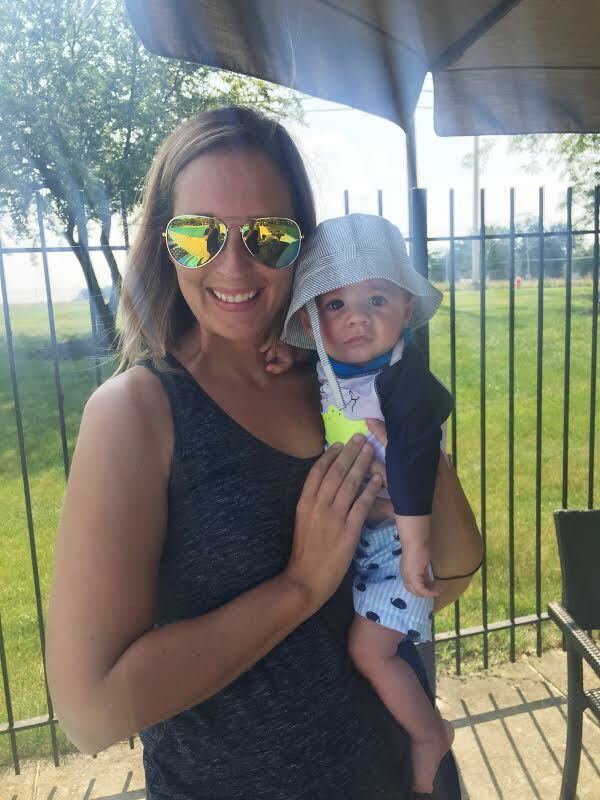 We took our little fish to the pool for the very first time on Saturday! 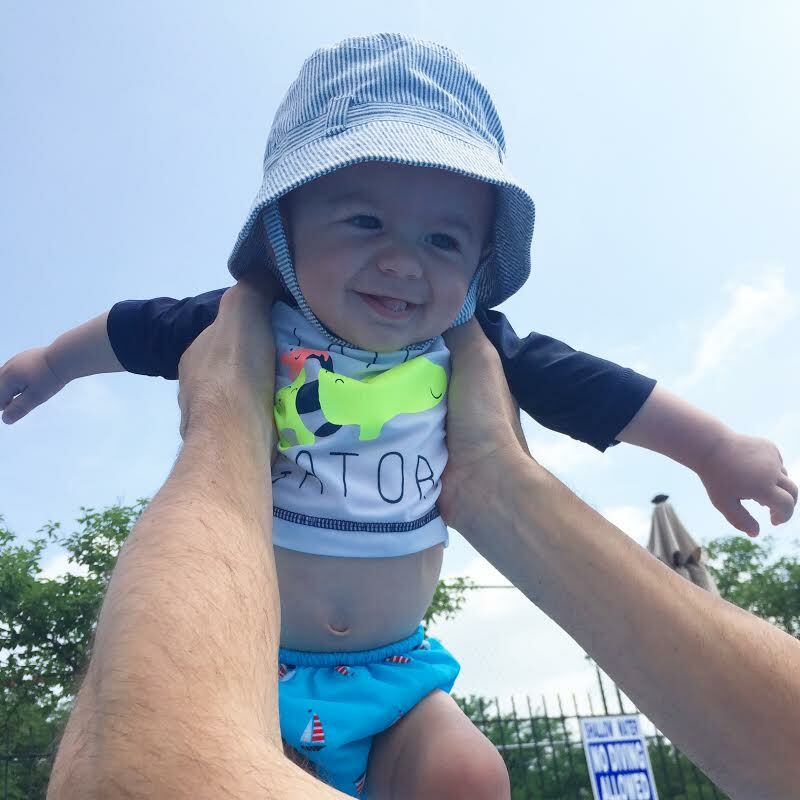 Seeing him in his little swim diaper, trunks, and rash guard was just too much cuteness. We brought a float with us that we were excited to put him in, but unfortunately the water came up to high when he was in it so we didn't use it for very long. As he gets bigger in the next few months I'm sure it'll work better! (we got this one-so cute) He looked like he loved the water, though! It didn't take very long for him to start kicking and splashing. He loved being carried all around in the water and was all smiles! Every new "first" with him is so much fun, and this was no different. 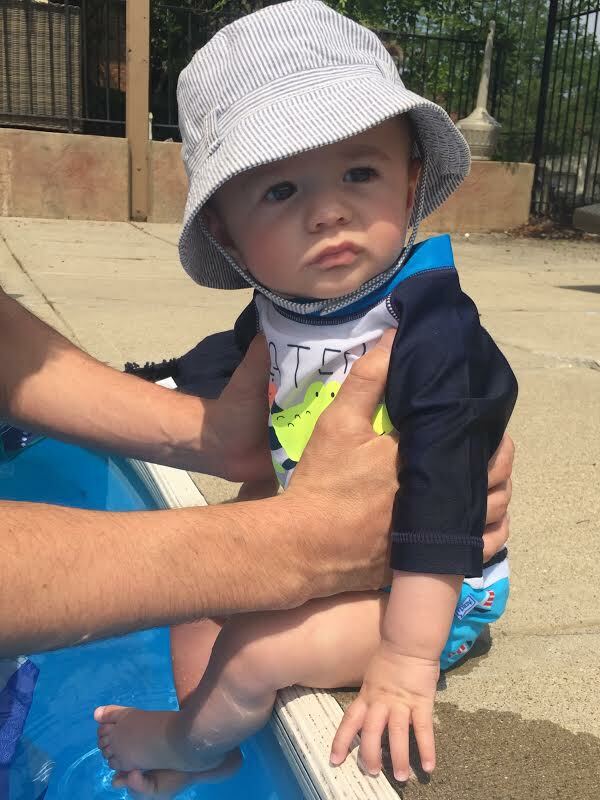 I'm hoping we have a lot more pool days in our future this summer, especially since he just started sitting up on his own! He's still a little wobbly, but once it's for good I plan to buy a little baby pool for our backyard. That's a must, right?! I carry the SPF 50+ mineral lotion and stick in my diaper bag, along with the after sun spray and their best selling PhysiObébé (comes in a travel size) The after sun spray is great to use for refreshing after a day at the pool/ocean, and the PhysiObébé is a no-rinse cleansing fluid that can be used on the face or diaper area. Great for those times that you can't get a bath in until later in the evening, but want to clean your babe up a bit! They also have this limited edition sun bundle. And one more picture because well...I can't handle his sweetness. Doesn't he look so big? On Sunday, we wanted to celebrate Father's Day early with my Dad because next weekend we will be at the cottage boating with Billy's family. 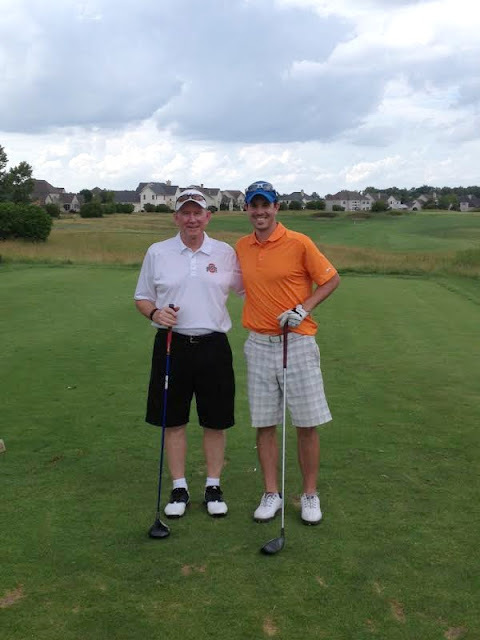 Billy took my Dad golfing in the afternoon then we had my parents over for cookout! I got my Dad this shirt (in grey)...couldn't resist. ha. Hope you had a great weekend, everyone! I took my little guy swimming for the first time this weekend too. I thought it would be super dramatic but he seemed to like it! And their little swim suits are just the cutest! He is such a darling little baby!! Wish we lived closer for playdates!! I had the same issues with floats last year-and even have the exact one you have. My guy was a very tiny 5m-8m last summer. I looked high and low for something with support that would let him sit high enough to not drown;) The link above is what we found that actually worked. My son loved it so much he would fall asleep in it. I always suggest it to moms with younger/ smaller babies. 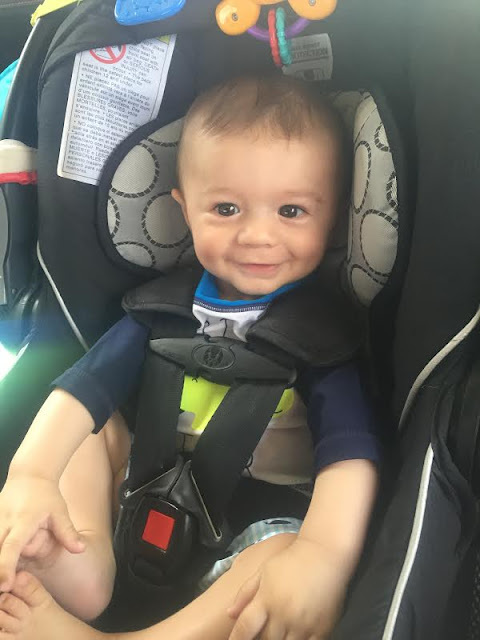 Look how happy your little Cam is... 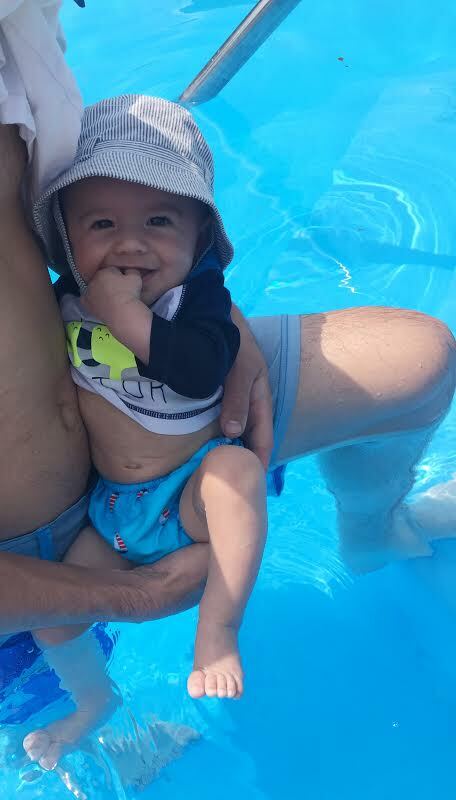 He loves the pool!! He's the absolute cutest Katie! Seriously!